Vibraton-CH – a desktop alarm clock with LCD display and a vibrating pillow designed specifically for people with hearing disabilities. This device is simple and at the same time is able to significantly simplify the lives of deaf people. Because of vibration signal, the user can easily see the time, without attracting the attention of others. Very useful for hearing impared people is also a “vibrating pillow”. This device is placed in to the bed of the owner and enables in a given time, waking up a sleeping man by vibration. adjustment of the display brightness. 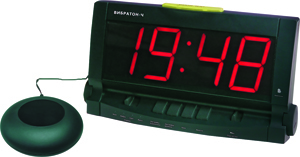 Alarm Clock Vibraton-CH operate on AC power and the built-in battery (9V battery).